You can probably count on both hands the number of countries in the world where classic melodic hard rock remains vital. Finland is one of them. From Helsinki arrives King Company, created by drummer Mirka Rantanen (Warmen, ex-Thunderstone, ex-Kotipelto, and others) and includes a bevy of fellow Finnish hard rockers: Antti Wirman (Warmen) on guitar, Jari Pailamo (Kiuas, Ponies To Kill) on keyboards, Time Schleifer (Enfarce) on bass, and Pasi Rantanen (ex-Thunderstone) on the microphone. One For The Road is their debut album for the Frontiers Music label. 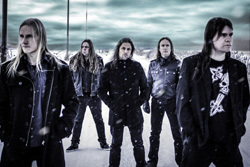 Broadening the King Company sound beyond classic hard rock, their music has a significant metal edge, thanks to sharp riffage and bristling solos. Still, there's something more. In more than a few songs you can detect a subtle blues flavor, in the same fashion Whitesnake always slipped it in to their tunes. Notable examples include Shining, Desire, One For The Road, and No Man's Land (which was the band's original name). The latter song flows more like a hard rock anthem, yet steady almost smoldering like a fire grasping for more air. Additionally, you can't discount the AOR factor in their tunes. The songs are loaded to the brim with solid melody, good guitar and vocal harmony (Rantanen sings clean yet with a little rawness to his timbre), likable refrains, and fundamental rock groove. Yeah, this is heavier melodic hard rock, yet accessible and arena ready with Farewell and One Heart just two songs delivering that AOR momentum. All in all, King Company's One For The Road is solid and entertaining classic, a bit metal heavier, melodic hard rock with well-crafted tunes from some talented players. Recommended. 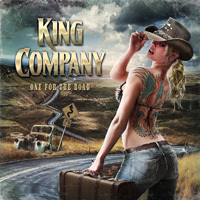 King Company's One For The Road is solid and entertaining classic, a bit metal heavier, melodic hard rock with well-crafted tunes from some talented players. Recommended.